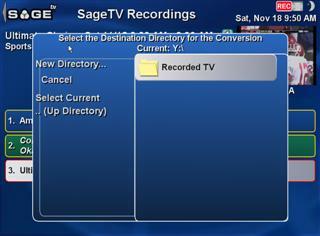 Well, the guys at Sage continue to release new/updated versions of their TV/PVR software, and I got my hands on their latest version still in beta, 6.0. A brief history of SageTV. 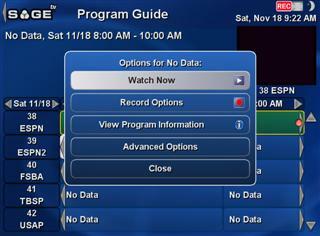 They've been around since 2002, and gained their most publicity as being the first TV PVR software to support multiple tuners natively. 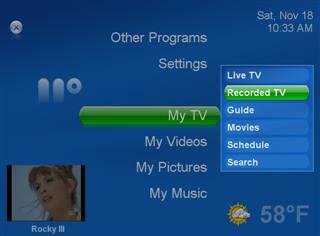 Since then, they've continued their innovations & have one of the most solid PVR applications for your system. One complaint they've always received is in regards to their UI and lack of comparable Media Center abilities, so let's see how they've improved. 18. 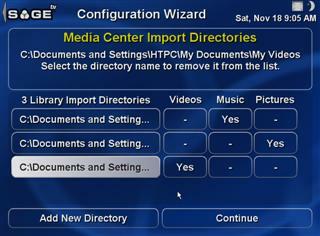 Conversion of files (transcoding) is fully integrated into the UI; as well as managing the transcode jobs. 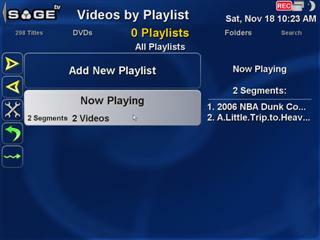 Any format SageTV can play it can transcode with the exception of WindowsMediaVideo9 and WindowsMediaAudioLossless. 4. 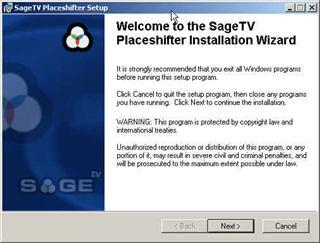 MS-DRM detection – SageTV can identify that a file is protected with Windows Media DRM. 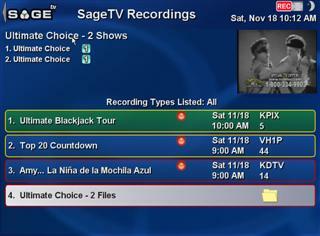 A SageTV exclusive that utilizes proprietary algorithms to determine your interests based on past viewing habits and automatically records programs for you. 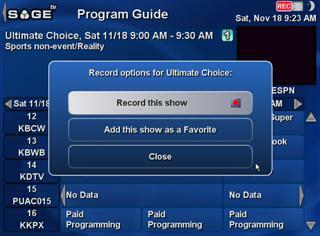 Find your favorite show and hit record. It's that easy! 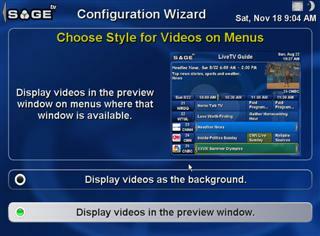 let's you customize or develop new applications for SageTV . Record two or more shows at the same time! No limits to the number of tuners allowed. Never miss your favorite shows whether it's first runs, re-runs, or all episodes. Video Card: PCI/AGP bus graphics card with overlay. NOTE: While it is recommended that your graphics card drivers support DirectX9 for optimum performance, it is not required. DirectX v9.0 or higher available freely from Microsoft. Java Runtime Environment 1.4 or higher available freely from Sun Microsystems. Fairly standard setup, nothing super fantastic, but not too shabby. 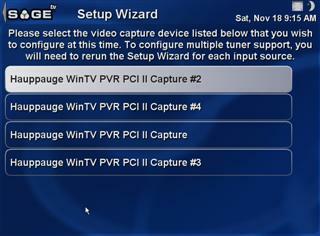 It should be noted that while I have 2 PVR500 dual tuners, I'll only be testing Dual Tuners. 4 Tuners works fine, but I feel 2 tuners is more appropriate to a normal user. Now on to the review! Now, I must start out by saying, if you've ever read any review of a previous version of SageTV, and were expecting some nice new UI changes…I'm sorry to say it hasn't happened in this version. 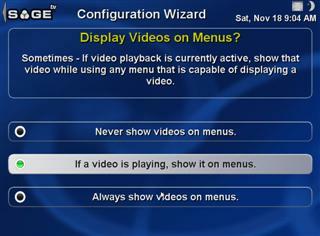 Most of the screens you'll see below will be identical to what we've seen from versions 4 & 5 & earlier. Not to say it's a bad thing necessarily, but I'm just not used to testing software where even the background image hasn't changed in 2 FULL RELEASES! That being said, we are a fairly new site, so I'm anticipating new readers & HTPC fans, so I haven't excluded anything, and am making this review fairly screenshot-heavy, so that people have an exact idea of what they get with this software. Rather than include every screen, I'll try to limit these to just those that are unique. As you can see, every step is clearly labeled & informative. One note of frustration, is that if you have multiple tuners, you must individually configure each tuner's guide. While this is great if you need multiple guides, it gets annoying if you simply want the same settings used for every tuner. 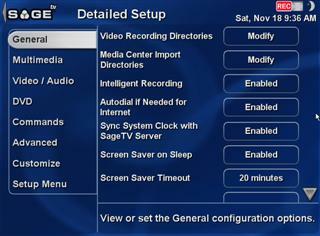 In case the original setup just wasn't enough for you, there's also a Detailed Setup features available under the Setup Menu within SageTV. 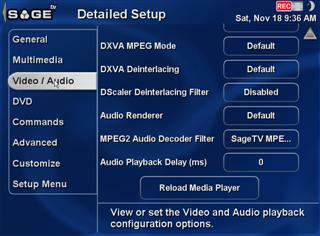 Within, you can view/modify the decoder settings, audio, and pretty much ANY setting you'd want. 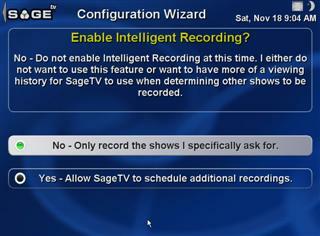 This is a key benefit of SageTV in that basically the entire program is configurable to your likings. The Videos section actually surprised me as far as ease of use as well as features. 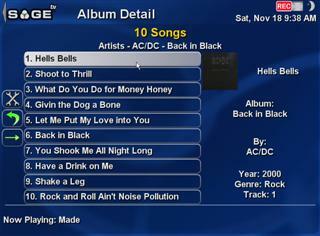 It's done very cleanly & offers some items missing from other software, such as Video Playlists. Apparently the thumbnails are a new feature, and its done well & quickly (of course, you can customize it to your liking as well). 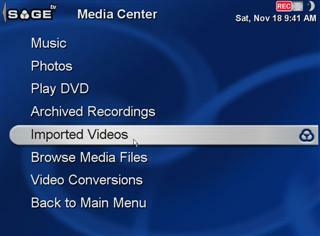 To view Videos, you select "Imported Videos" under the Media Center Menu. 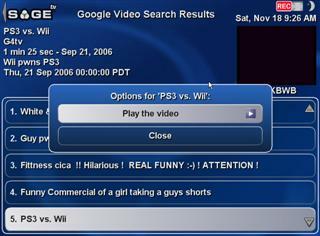 Default view by titles. Pretty cool, how it actually pulls out all the video files from your folders — Very cool, just make sure you label your movies better. 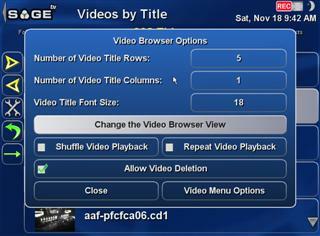 View details on Video files. 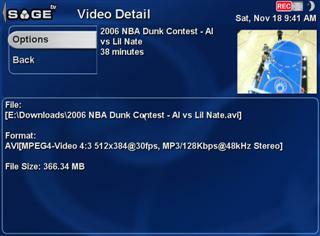 More info than most, with File Location, Format & Size, and of course playing time. Playing a file, nothing special. Easy to follow. 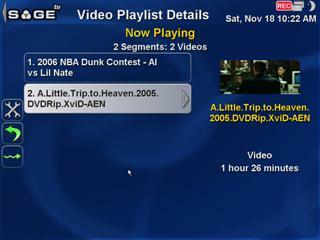 The Video Playlist with a few files on queue. 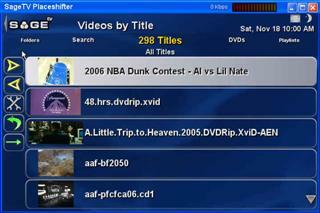 And here you can search for video files. 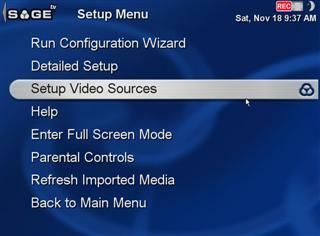 Pretty useful if you have a lot of videos. 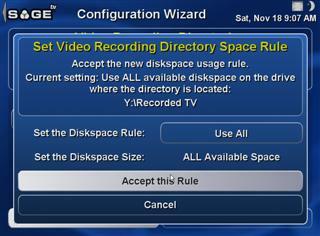 I'm assuming this section is handy if you have a DVD changer? If anyone wants to donate me one, I'll be happy to test it out. 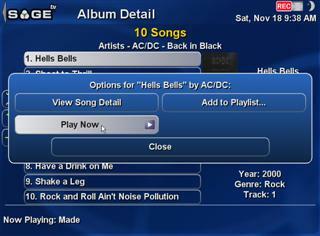 Create your own custom playlists for videofiles. 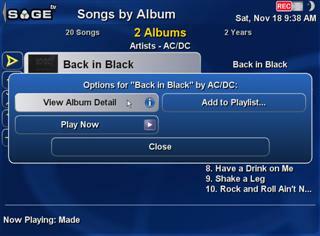 Pretty neat how it shows you what's inside the playlist without having to open it. 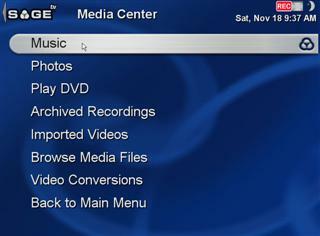 Another Media Center function included in SageTV is Music. 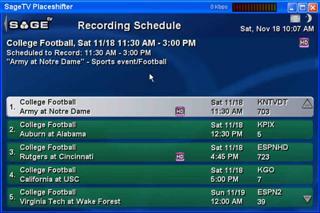 Nothing super fancy here, but something like this is to be expected out of any Media Center software. 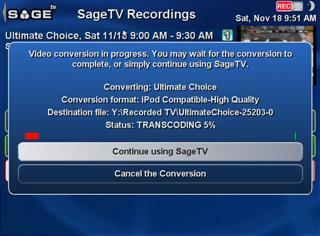 One thing I would expect which Media Center does that Sage does not, is auto-play a Music CD. It was an odd experience to insert an audio CD & have absolutely nothing happen. Maybe the assumption that everyone has all their music on their HD is still a bit premature, I still own a huge binder full of CDs. 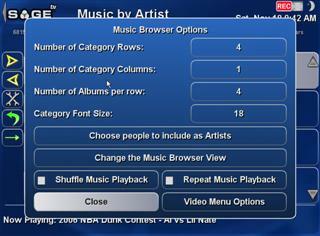 Click Media Center on the main menu, then Music to enter. Default view organized by Artist. The sweet thing about music is all the different ways you can view your music: by Album, Song, Artists, Genres, Playlists, Folders & Even the Year the song came out! 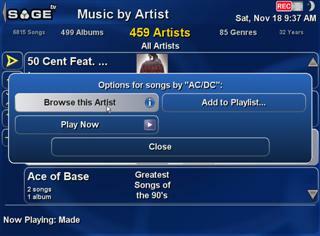 Click on the artist & you have the options to play. While it's nice to have this control, you'll see having to multiple click to get anywhere gets annoying fast. Here's a look at the Album View. Again, I love how it shows you what's within the album on the right side without having to open it..
And when you want to go play a song…you guessed it… you have to click on another dialog. 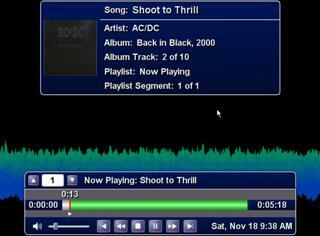 Finally playing a song, with the default visualization. 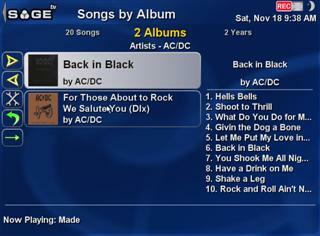 And playing a song with no visualization, strictly the album title & copy of cover. 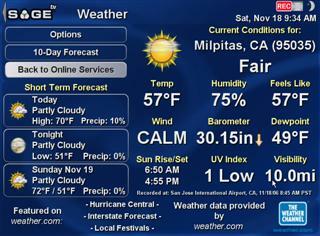 And like every menu section, the ability to customize the appearance to your liking. 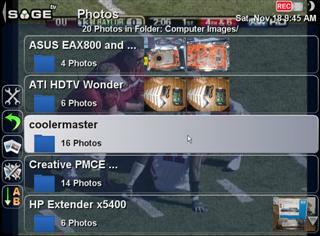 Nothing radically different about the photos feature versus music & videos, so I'll make this part quick. 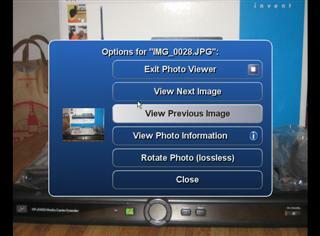 As with every other section, you can customize exactly how & what you want to see within the Photos. 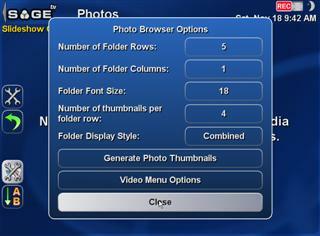 Slideshow feature of course, and you can rotate a file directly from it as well. 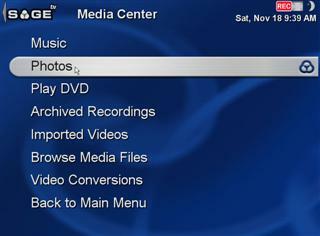 Something that SageTV has really been playing catchup on Media Center & others is the online features of its software. Without huge corporate backings they've really had to tackle this issue on their own. So sure they don't have huge online sponsors like Microsoft's Yahoo or MSN Online Spotlight, or even MTV Overdrive, but on the other hand the features they DO have are much tighter integrated & actually part of the software. One point of curiosity….is why did Sage decide to invest so much time into a Google Video plug-in instead of YouTube seeing as it's the dominant force in the market & now owned by Google anyways? Yup….3. That's how many Online Services you get. 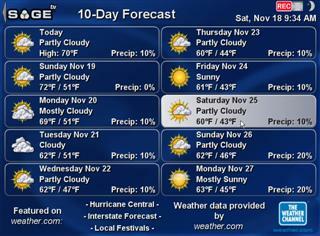 Weather, Google Video & TV Show Editorials. 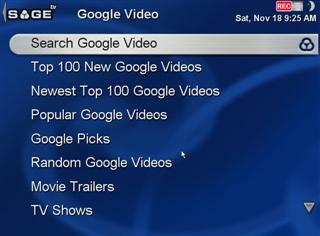 The Google Video menu. Makes it easy to find something you like. Standard little waiting message while it pulls the data for your choice. This went pretty quick on my DSL connection. 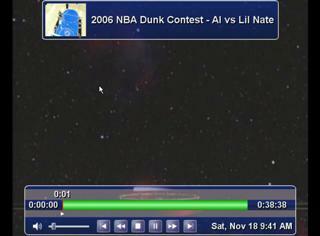 Very clean & easy to follow interface of videos, with some details above, thumbnail & video length. 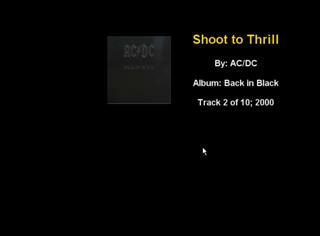 Click on a video & you have the choice to Play or Close…. And then just wait while your video is being buffered. Again, I was pleased at how quickly this loaded, doesn't seem to be much a difference in time using this versus your browser. 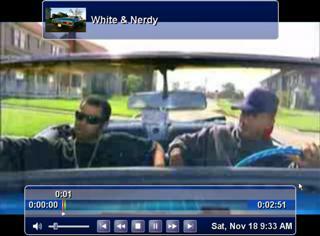 Playing your video with the same Video Interface your familiar with is nice. 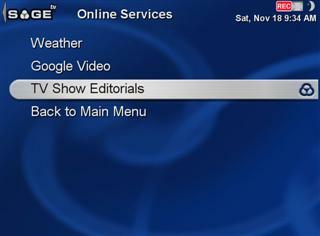 Another feature is the TV Editorials. 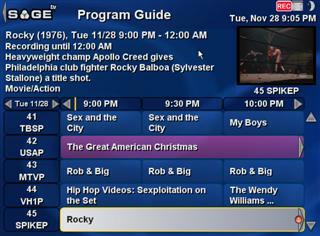 I personally wouldn't use this very often, but I'd imagine owners of TV Guide love this sort of thing. 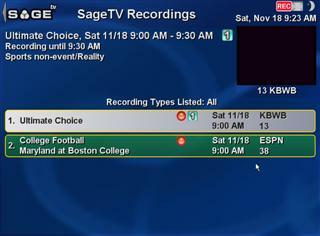 So all that is nice and all, but let's face it, SageTV's bread and butter is in just that, TV. It's what they've always focused on and to be fair, what they've done best. 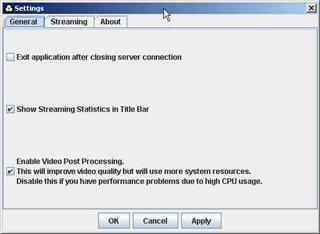 All the other features have always seemed to be thrown together merely to be able to compete feature for feature with the other Media Center applications out there. 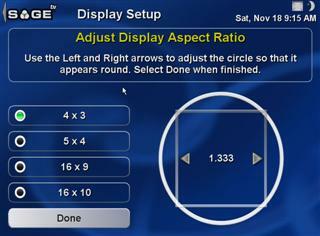 You can see from the Main Menu that TV is definitely the focal point of this software. 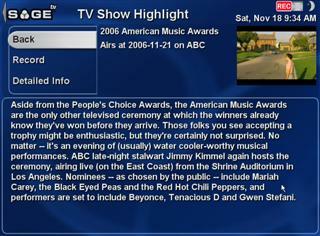 And we have live television…ooooooh…ahhhhhh. 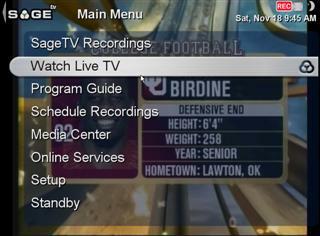 Some menu options from the LiveTV view. You can basically go anywhere from here. 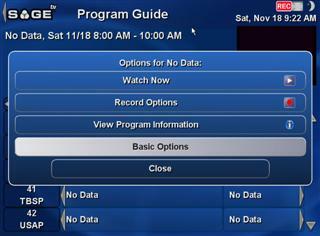 The program guide is easy to follow & color coded. 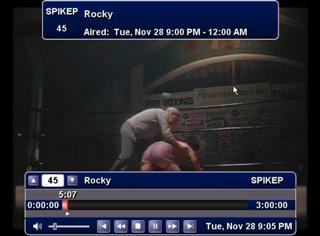 Keep in mind, this is with the Thumbnail display of what you're watching in the top right. 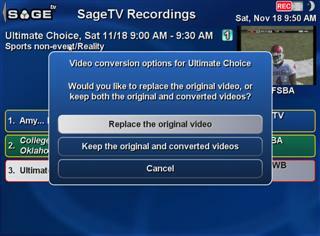 See below for how video overlaying works in Sage. Click on a program & you get a dialog box (you're not surprised anymore, are ya? :-P) with some basic options. 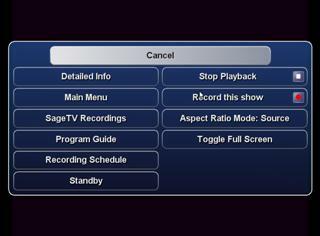 …and you get kudos if you can figure out the difference between the basic & advanced options, as I could not. 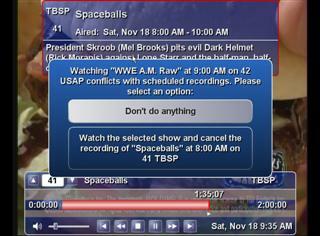 When you wish to record the show through the guide, you can straight record or add it as a favorite, which will always record it. 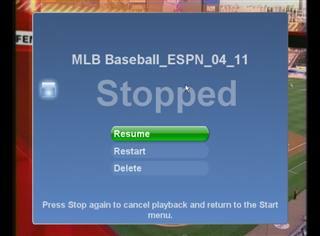 Here's the Recordings view. Very simple to follow, red dot means it's recording. 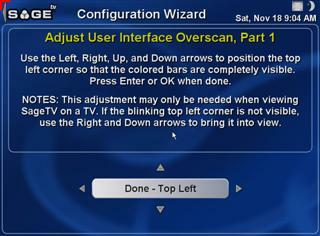 The guide color by genre remains consistent as well. 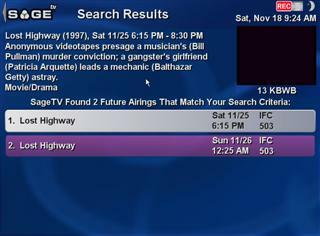 If there's a way to search to find a show you want, Sage has got it. 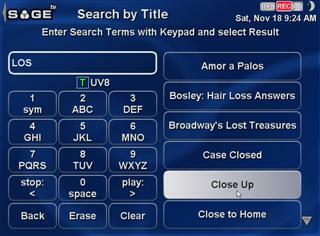 Definitely the most comprehensive search I've seen, ability to search even by actor or description. As soon as you start the search, you see the results on the right. 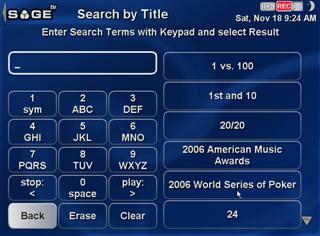 And typing with the remote is simple & the little display shows you how many times you have to press the key to get to the letter/number of your choice. Nice to see for new users. 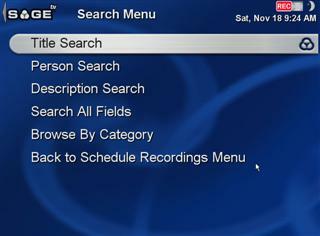 Search results are clear, and show all future recordings that it has. 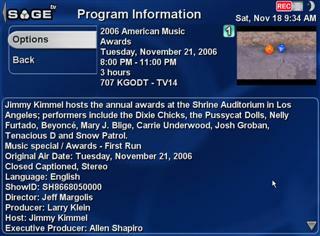 View detailed info on a program, gives what you would expect. Pretty simple conflict management, but the important thing here is that it's clear. Great news for those of us that share our PVRs with our family, this way it makes it difficult to miss a recording due to an erroneous click. 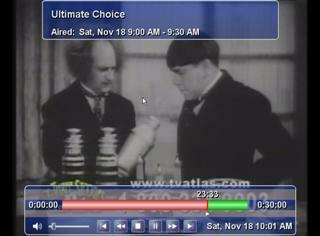 And here you can see the overlay of the LiveTV on the main menu. Something to note, if you choose the thumbnail option instead of the overlay, TV actually stops when you go to the main menu. 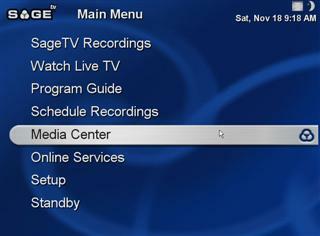 Here's where SageTV really stands out compared to Media Center. 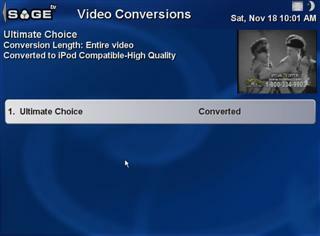 Built into the recordings section, is the ability to convert your recordings into a different (read: smaller) format, even for iPods! It's a great feature that worked pretty well in my experience. Keep reading for some screenshots of this in action. And there's even more than these I've captured here. 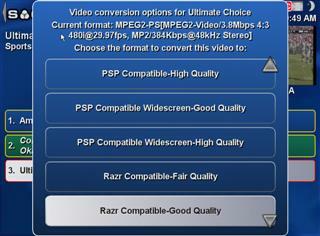 Converting is as simple as selecting the format, and then you choose if you want to Replace the recorded file to save HD space, or just convert it into a new file. You then select the folder you want the converted file to go into. If you go to the conversion screen, you can see the percent complete & check up on all the files in queue as well. File conversion complete. 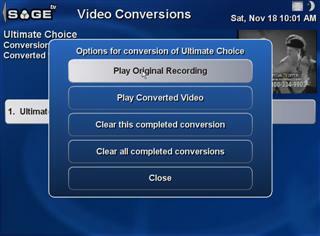 Once converting completes, you have some options Playing the file resulted in expected quality, and the controls are just as if you were watching the original. Here's the neat thing…when you're done converting, the file is still found under the Recordings menu. Makes it very easy to find. 212mb file into 72mb, not too shabby. 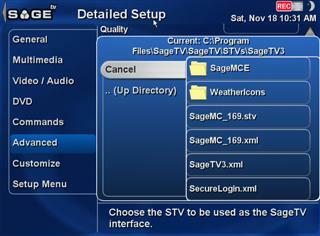 Oh, and did I mention that Sage records in MPEG format, not DVR-MS, so there's plenty of programs that'll allow you to edit it as well! That is an impressive list, and if you're willing to take the time to read about installing each one, there's no doubt they are effective. 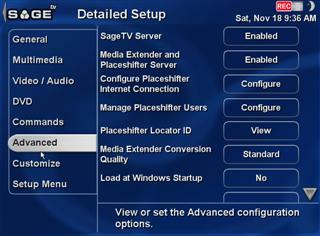 However, after their 6th iteration of SageTV, I was hoping they would have implemented a Meedio-ease-of-installation system for their plugins by now. 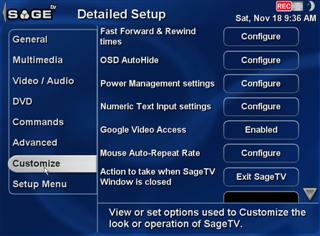 For this review, I'll highlight one of (what I feel) is the most important customization available, SageMC, which allows you to change the default bland User Interface of SageTV. I would cover the aforementioned plug-ins, but then this review would be around 100 pages. 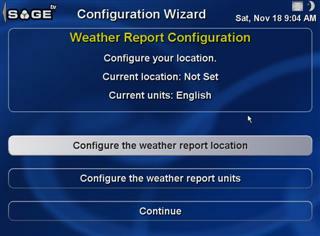 You can access the Customization feature in the Detailed Setup > Advanced page. 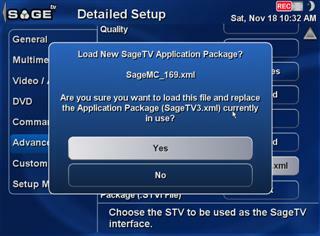 Just find the *.STV file & it'll load your application. 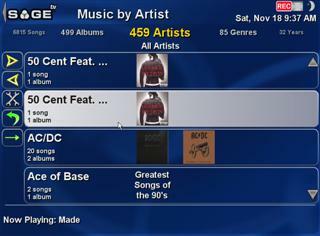 This will no doubt look familiar to Media Portal users, as they used some of those graphics (with permission) This is not just an appearance skin, but also changes the way the app works, making MCE users feel right at home. 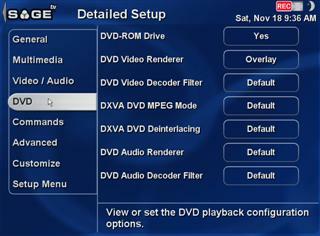 If you're a Media Center user, by now you're probably as sick as I am of hearing about SoftSled – An oft-rumored application which would allow you to use another computer as a Media Center extender, to allow you to view LiveTV from any system in your house. 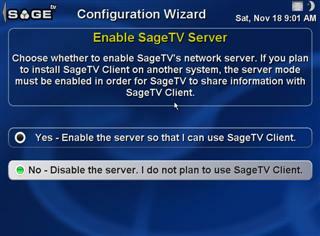 Well, SageTV has just the thing with Sage Client, which can work in your home network & is basically the identical Sage interface and can run on any PC in your home assuming it meets the minimum requirements. But what if you want to enjoy this while you're on vacation or at work? That's where Placeshifter comes into play. Since the interface for Client & Placeshifter are almost identical, I'll cover Placeshifter only. 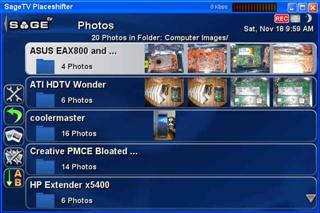 The idea behind Placeshifter is identical to Orb or Slingbox: Access your media center computer from anywhere in the world. The downside to this versus Orb is, if you're like me & don't have access to the router you are behind, I've yet to find a way to bypass that. Orb works through your browser's proxy & allows you to access it without having to open any ports. While I'm sure it makes the quality less-acceptable, at least it works. Connect to a client on your network, or Add another which you can do via your IP address. Some settings you can configure depending on your network speed. 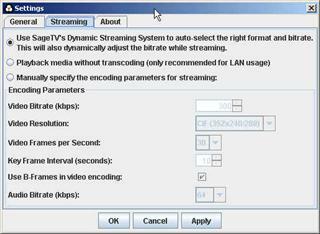 And some more streaming options, something Orb doesn't have, which allows you to specify your resolution. Same menus & functions, which makes learning it a cinch! 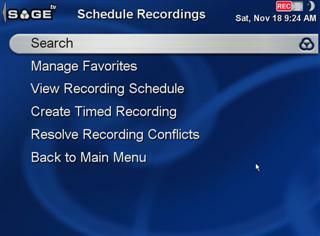 And view your upcoming Recordings as well. So what have we learned? 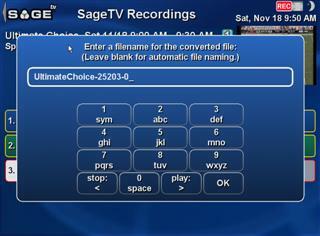 SageTV is a very capable PVR software, and to their credit, have made great strides in at least making their other features work easily. 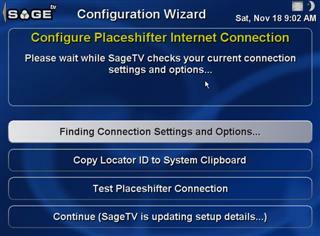 The unique feature of Sage is the power & control you the user has over everything. 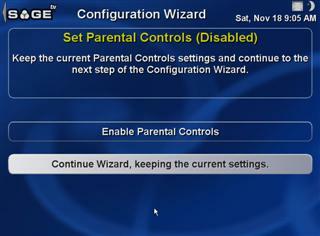 There really isn't much that you can't configure. This is a pro & a con in it's own, because some novice users might be intimidated by all of the many options available to them. Sure there's a certain audience that wants all those menus & boxes, the majority of users just want a simple launch & go interface, which is somewhat lacking here. 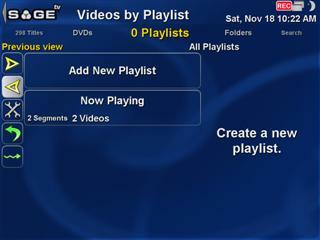 I've followed SageTV for years, and love what they do & how dedicated they are to the community, but I've got to beg them to change their User Interface. It's almost exactly the same as it was when it launched in 2002…and it looks it. 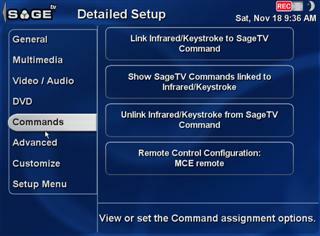 Sure a user could go & download a customization, and read the manual on it, and install it, and change it…but wouldn't it be easier if they incorporated something like Meedio did, allowing you to do all that with the remote? Or by default at least include a few different skins than the boring default? I think what confuses passerby users about Sage is that there have been several full releases, which while include a plethora of new features (as shown by the laundry list on page 2), looks identical to previous versions. Sure a change in interface will upset some old-loyal users, but it'll really get some new attention. They work behind the scenes on Sage a ton, and it shows. My experience this go-around was much smoother than the last time I played with version 3, I believe. 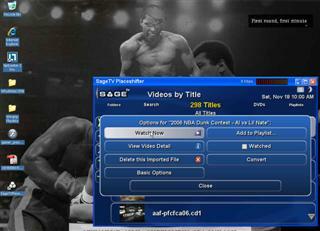 If you crave the utmost abilities in your PVR software, there's little else which can do more than SageTV. Placeshifter is wonderful & is a nice alternative to Orb, albeit it at a cost. 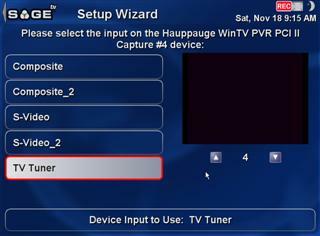 The ability to extend to televisions with an inexpensive Hauppauge MVP is a lot more attractive (and more powerful) than the several hundred dollars for Media Center Extenders. 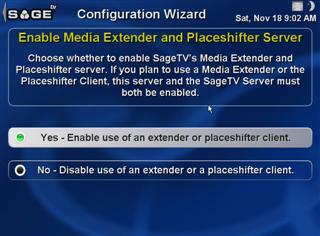 The debate of course, is after the purchase of an XP license, and SageTV….and then Placeshifter for 1 computer…and then maybe Client for another….is it really that affordable? If you need the control or like tweaking/making something your own, then absolutely. 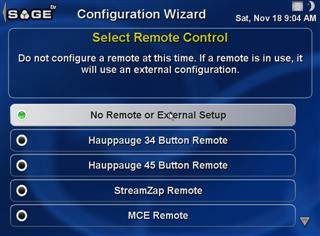 There's few other programs out there that allow a user to have so much control over an application. 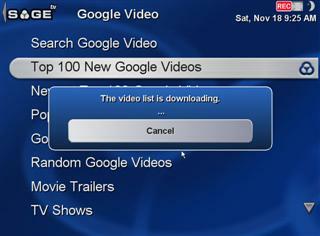 Why Google Video instead of YouTube?